PREMIUM TIMES, PTCIJ and the Centre for Democracy and Development are partnering to ensure comprehensive coverage of the elections. Voting commences at 8:00 a.m.
7:09: Election materials have been distributed to all the wards except for Ward III and Ward IV as escorts are still being awaited in Oron, Akwa Ibom State. 07:04, PU 9, Ward 1, Itapa local government, Ekiti North. According to the PO, everything is ready and they will surely start by 8:00 am. Other INEC ad hoc staff are piling into vehicles ready to go their various PUs. There are about five security personnel on ground. 07:09 am: RAC CENTRE 005 St. Luke CAC primary school, Owo LGA, Ondo North Senatorial district. INEC officials have started departing to various polling units. Unlike other RACs, Some of the officials are trekking while others are going by motorbikes to their polling units. 7:25 am: In Ibesikpo, Akwa Ibom State, the process is peaceful. Material are said to have been dispatched to the units. But electoral material are yet to reach Obot Idim polling unit. 7:33 am PU 002/003. Three voting points. All materials are available. And all officials are quite ready, waiting for voters. Four police officials are here. And the officials said voting is going to start in due time. 7:30 am. PU 003, ward 02, Station road, Jebba, Moro LG, Kwara North. No INEC official here at all, materials have not been delivered, only three policemen are on site and they can be seen praying. 7:10 am: Ekan Garage, PU 08, Omu Aran. INEC officials are getting prepared to start the election by 8 a.m. People are seen hanging around for the election. 7:20 a.m EDO NORTH Etsako Central, Fugar Ward 3, PU 004, Reg area code 03 The Presiding officer and adhoc staffs are present, they are setting up, party agents are around and the citizens are also present. 7:34 am.PU 006, Maje North, Kwamba, Suleja Local Government, Niger State. No INEC official in sight, no materials in sight, voters are arriving, 3 FRSC members on ground. Gagumari polling station, Hadeijia Local Government, Jigawa State, Adhoc staff have all the necessary materials except the ballot papers. 07:43 Voters and security operatives belonging to the Nigeria Police awaiting INEC officials at the NUJ PU, Moscow Road, Port Harcourt City LGA. 7:38am, Ovia Southwest LGA, RA 01 – Iguobazuwa East, PU 003, Iguobazuwa Ozolua Primary school III, Corps members are currently setting up in preparation for the accreditation and voting process expected to begin by 8am while the voters look at the wall in search of their names. There’s a total of 1093 voters on the voters list. 7:42a.m EDO NORTH ETSAKO CENTRAL, FUGAR WARD 3, POLLING UNIT OO5. At osagbe primary school, fugar, the presiding officers and adhoc staffs are almost done setting up, people are already here to exercise their civic duty. 7:23 am: At Township Primary School, Ogurute, Enugu Ezike, Igbo Eze South, INEC officials are seen arranging the materials, and about 20 voters are seated waiting to vote. 7:46 am: PU 01, Ward 1, Atiba, Oyo State. Corp members are just arriving. Six policemen are seen on the premises. 7:37 am: PU 020, Apo resettlement, Abuja. Voters queue up waiting to to vote. Voters turnout quite impressive. The officials are yet to set up. An official who gave his name as Ahmed said they are still waiting for materials. 7:45am: At INEC Office Enugu North LGA, an accredited observer was not allowed access to the INEC office despite showing all his accreditation materials to security operatives at the gate. 7:40 am: Officials have finished sharing materials at LEA Primary School Ushafa, Bwari Area Council, Abuja. Materials and staff now being conveyed to polling units. 7:41am. PU 001, Ward 01, UMCA LGEA school, Jebba, Moro LG, Kwara North. There are no INEC officials here, election materials have not arrived, no security personnel here either. Voters are here already, waiting for them to arrive. 7:37 am: At PU 012, Araromin Opin, Etiki LGA, Kwara South, Election materials, INEC ad hoc staff, security personnel, a few party agents already at the venue, waiting to commence election proper by 8 am. According to the PO, Mr Emmanuel, their allowance will be paid after the exercise. Voters turned out as early as 6am to cast their votes. They wait patiently for INEC officials at polling unit 005-006, Akwanga police station, Nasarawa State. 7.53 am- Demonstration Primary School, Awka south, Anambra Central. PU1 VP1 polling booth has been set up. 7:37 am At PU 020, Apo resettlement, Abuja, voters are on a queue up waiting to vote. The officials are yet to set up. An official said they are still waiting for materials. 7:45 am Awkuzu Oyi Local Government,ANAMBRA North Senatorial District, Igwedo Primary School, INEC staff are setting up the PU and VP. 7;45am: At INEC Office Enugu North LGA, an accredited observer was not allowed access to the INEC office despite showing all his accreditation materials to security operatives at the gate. 7.53a.m: Demonstration Primary School (RAC), Awka South LGA, Anambra Central. Election materials are yet to arrive polling unit a few minutes to official kick off of voting. 7:54 am: At PU 15, Mayor, Suleja LGA, Niger State, no INEC official in sight. Two security officials and voters are just arriving. 7:50am:At a PU in Luguwambai ward, Lafiya, Nasarawa State where the Governor Tanko AlMakura is expected to cast his vote. Nsign of INEC staff or election materials yet. Only one police officer is at the unit at this time. 7:54am, PU 004, ward 01, Berger, Jebba, Moro LG, Kwara North, Kwara State. Just as the other 2 PUs visited, there are no officials here. No materials, no security men here too. Party agents and voters have started arriving. 7.50 Semetoko Primary School, Chikanda, Kwara North. INEC officials currently setting up polling unit as denizens begin to form a queue in anticipation. Some voters at P.U 020 at Apo Resettlement, Abuja are seen taking off campaign posters pasted around the polling unit. A voter who did not reveal his name said the reasons for their action was because elections are over and the presence if the posters signifies campaigns. “Campaign are over. Why did they leave the posters here? This is another form of campaigning. “You don’t leave such things here on election day. What message are you trying to pass? The voters were however, not restricted by the INEC officials or security officers. The presidential and national assembly elections are currently on-going. The electoral commission had instructed all candidates to end campaigns 24 hours to election day. 7.50 am: In Semetoko Primary School, Chikanda, Kwara North, INEC officials are currently setting up polling Unit as denizens begin to form queue in anticipation. 7:41am: Area court polling unit, Beji Niger east senatorial district where a lawmaker Muhammed Bosso Paiko is to cast his vote. Anguwan Sarki 1 Polling Unit Beji Niger East Senatorial District, one of those waiting is state Commissioner of Water Resources is Mamman Musa. According to the INEC officials, there are 1,446 registered voters and 1,300 ballot papers. This is the polling unit of Muhammad Dada Bosso-Paiko, a member of the House of Representatives. Voters are here checking their names and numbers. The ad-hoc electoral staff and security officials all on ground. 7:55am: At Saraki’s polling unit, PU006 ward 2 Ajikobi of Ilorin West local government, Kwara Central, INEC officials are yet to arrive. No sight of the ad-hoc staff and the electoral materials. From all indications, the voters turnout in Bauchi promises to be impressive. As early as 7am, voters in Bauchi metropolis and the surrounding neighbourhoods such as Barkin Kura, Kofar Ran, Makama, Nasarawa, and Sarkin Yelwa of Bauchi Local Government are already at their polling units waiting for the arrival of INEC officials. There appears to be a delay in the distribution of materials at RAC centre in Makama as tens of corps members and INEC officials were trying to retrieve election materials. Restriction of movement around the state is lax as commercial motorcyclists and other vehicles were moving freely around the town. There are also few security roadblocks in the metropolis. So far, voters are conducting themselves in an orderly manner, checking their names or the registers pasted at their polling units. 8:08 am. Enugu west senatorial district, Awgu lga, Central School. Officials yet to arrive. Electorates waiting. 8:01am: Zanfara polling unit 003, bida LGA, Niger south senatorial district, Niger State. From all indications, voters’ turnout in Bauchi promises to be impressive. As early as 7 a.m, voters in Bauchi metropolis and in neighbourhoods such as Barkin Kura, Kofar Ran, Makama, Nasarawa, and Sarkin Yelwa of Bauchi Local Government Area are already at their polling units waiting for the arrival of INEC officials. There appeared to be a delay in the distribution of material at RAC centre in Makama as tens of corps members and INEC officials try to retrieve election materials. Restriction of movement around the state is lax as commercial motorcyclists and other vehicles are moving freely around town. There was an insufficient supply of chairs and tables at units 5 and 6, ward 3 in Ifedore local government area Ondo State for electoral officers. Only a single table was provided. But the community had to rally round to get tables and chairs for the electoral officers. The situation resulted in the delay in setting up of the polling unit. 8:08am Ikot Ekpene Ward 1, PU 10 Akwa Ibom. Materials have not arrived and the people are just standing around. 8:07am. At PU 003, Ward 01, Station road, Jebba, Moro LG, Kwara North. INEC ad-hoc staff just arrived and they are setting up the place. About 10 security officials are on site. 08:10 am: At PU: 16 Ward: 1, Itapa/Osin LGA, S/D: Ekiti North, voting has not started. The voting cubicle is in clear view and not in anyway hidden. One security personnel is on ground. There is an argument between the ad hoc staff and the electorate. They are set in the veranda of an house and they mandated that the door leading into the house is shut and not to be opened until after the election. People are arguing that they have a right to enter their house. They are threatening to eject the ad hoc staff from their house. Voting begins at Unit 6, Ward 1, Ifedore in Ondo State at 8.17 a.m.
Situation Report* In a conversation with the SPO of Tofa LGA, he said none of the polling units was given the tendered ballot papers. He said they’re making every efforts to reach the state headquarters to complain..
8:09 am: At PU 012 Araromin Opin, Etiki LGA, Kwara South, PDP House or Assembly aspirant, Tajudeen Lawal, casts his vote. He refused to be photographed. 08:18 a.m: Election materials are yet to arrive any of the polling units of Sagbama and Tungbo communities of Sagbama LGA, Bayelsa State. 7:53 am: Ovia Southwest LGA, RA 01, Iguobazuwa East, Iguobazuwa, Ozolua Primary School 1,Edo State has 1267 voters. Voters are already showing eagerness to vote as there’s a formed queue already. Soldiers in Akwa Ibom impound several vehicles at Edet Akpan Avenue (Four Lane) for violating the no-movement order on Election Day. One army officer said the vehicles would remain impounded till after the polls today. 8:11 am: Awkuzu Oyi Local Government Anambra North Senatorial district PU 017 Ward 4 ad hoc staff have arrived preparing the center. The PO says no table, no seat, no security… According to the PO, when he called the EO about the security, the EO said they were working towards it.. Although the Community leader promised to provide seats and tables. There are 553 registered voters here. President Buhari and wife voting in Daura, Katsina State. 8:19 am. At PU 009 Bebeji Doromawa in Kano South, election is going but having challenges with card reader authentication. 8:23 am: At PU 005, WARD 07, Kurmin Sarki, Suleja LGA, Niger State. INEC officials have arrived and are setting up, voting has not commenced. Etoi Unit 03, Uyo, Akwa Ibom State. No INEC officials or materials. No voters. Just 2 police officers here waiting. Unit 1 Ward 3 Election about to commence. Briefing by INEC officials. All the polling units in Tungbo community of Sagbama LGA, Bayelsa State are deserted. No INEC or security officials to be seen. 8:23am: PU 005, WARD 07, Kurmin Sarki, Suleja LGA, Niger State. INEC officials have arrived and are setting up, voting has not commenced. Campaign posters are visible. Voting yet to commence as presiding officer complains of lack of transportation to get them on time to the polling unit. 8:15 am: At Ada Maifata 004, Wamakko, Sokoto North, Sokoto, the P.O said the Card Reader is showing ERROR. They’re trying to check with the next polling unit for one. That is the challenge. 8:35am Ward:9,PU: 008, Ijebu-ode L/G. Ogun east senatorial district,Ogun state.Voting as commenced,but the card reader fails to authenticate.INEC officials are on their way to remedy the situation. 8:22 am: Accreditation has started at PU 001, ward 11, Saki West LGA, Oyo North Senatorial District, Oyo State. Voters discredit the unavailability of any security personnel. 8:09 am, Iwenujie Primary School, PU 007, Irrua, Esan Central LGA, Edo Central Senatorial District. Materials just arrived a few minutes ago and the ad-hoc staff are preparing for the electoral process. Security personnel are in place. The INEC officials here resumed late and they are setting up slowly. 8:23a.m. Enugu west senatorial district, Awgu lga, Ward 3. Boy’s secondary school Mgbowo. INEC officials seen planning on how to distribute materials to PUs. Ad-Hoc staff (mainly corp members waiting to receive material). 8:42. Enugu State, Awgu LGA. Community school Eziobodo 1 and II. Ward 3, PU 10 and 11. INEC staff yet to arrive. Voters on ground complaining of late arrivals of materials. 8:37am, Ward 02 PU 012, Shomolu Lga Lagos East. The PO Is addressing the voters, confirming that the ballot boxes are empty. 08:37am Ward 02, Unit 07, North East, Ibadan, Oyo State. Voters are set but the Electoral materials are still being set up. Major polling units in Ilorin, Kwara State Capital, recorded late arrival of election officials and voting materials Saturday morning, a random check by PREMIUM TIMES has shown. Our correspondent who went around the capital city in the early hours of election day reports that officials have remained conspicuously absent in some places even as voters have trooped out enthusiastically to exercise their franchise. According to the Independent National Electoral Commission, voting is expected to commence by 8:00 a.m. But when PREMIUM TIMES visited some of the voting centres in the state capital, voters were seen lamenting the late arrival of voting materials and INEC officials. As at 8:20 at Adewole Unit 009 in Adewole area of Ilorin, our reporter observed that officials were yet to arrive for the exercise. A similar development was recorded at Unit 010, also in Adewole area of the state capital. By 7:56 when our reporter checked at the polling units around the Emir of Ilorin Palace, many voters were seen with no visible presence of INEC officials. “We hope they would come around on time because people can’t wait to cast their votes,” a voter who declined to have his name in print told PREMIUM TIMES. 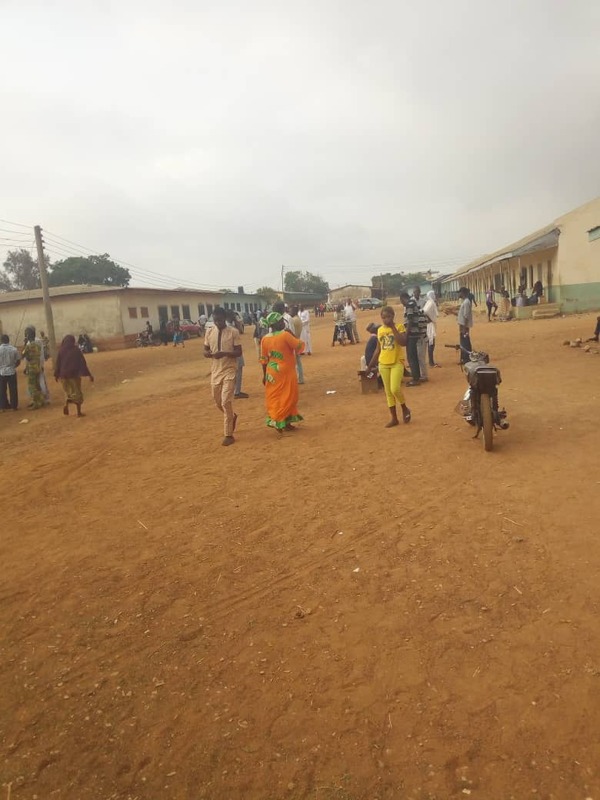 At Adewole Primary School, security officials were seen on the ground but electoral officials were yet to arrive as at past 8:00m a.m.
A voter, however, told PREMIUM TIMES that in some polling units in Tanke area of the state, electoral officials have begun to arrive and voting would soon commence. PU 1VP1 at Demonstration PRI SCH, Awka South LGA, Anambra Central. Voters clustering around as poll is yet to open. 8:32 am. Enugu State, Awgu LGA, central school extension. Ward 3, PU 005. 8:28 am: At Ikorodu LGA Lagos East senatorial District, Lagos State Polling Unit 1, Oke Eletu, accreditation is yet to start. Card reader issue at one of the voting points. 8:28 am: A Ward 5, PU 020, Ojo Local government, Lagos West senatorial district, Lagos State. No INEC official can be seen. Voters complain the unavailability of INEC officials and some even threaten to go back to sleep if there is still no show from the Electoral officers. PU003, Bida LGA, Niger South Senatorial District, Niger State. 8:38 am. At Eguare Pry Schl PU 004, Irrua, Esan Central LGA, Edo Central Senatorial District. Materials for the PU are being arranged. The names of voters are yet to be pasted. Voters are around waiting for the electoral process to start. There are 2 voting points in this PU. 8:30 am::At Government Secondary School, Wuse, Abuja, there are two pooling units. 008 and 009. There is a large turnout. Corps and INEC officers are setting up their tables. At pooling unit 008 at GSS wuse, Abuja, voting is yet to commence. People are getting agitated, asking when they will start. There was a hitch with the card reader, but it has been rectified. 8:35 am pooling unit 009, still within the GSS compound, people are filing to vote. 8.30 a.m: Voting started at KW/011/013, Chikanda, Yashikira, Baruten LGA. Kwara State. Senatorial District Kano North, LGA Tofa, Ward Zango na Abu, Polling Unit 009. At 8:40am: Late arrival of Materials due to lack of mobility. 8:41am PU: 9,ward 009, Ijebu-ode L/G,Ogun east senatorial district Ogun state.voting Is ongoing. The inec officials here also just resumed and they have a total number of 214 registered voters. Ward 1 is a branch of St.john, they came to usagbe primary school and they are sharing the same compound with ward 3. The picture above is a picture of ward 1. I’m enroute st john to go and observe. 8:54 am RAC OO2, Ezema ward, Igbo Eze South LGA, Enugu North. The P.O. brought out the card reader from the carton. They are set for the election. PU 5 of ward 005 of Owo Iga, smart card reader has not been functioning since the commencement of the election. The INEC officials have resolved to using manual. 8:48 am, Ogui New layout LGA, Obiagu Road primary school 015, Enugu North senatorial district. Voters are checking their names posted on the wall, but materials are yet to be deployed to the PU. One of the voters complained about the non-arrival of the INEC officials. He says it will discourage voters and even he would leave and not vote if the officials do not arrive in the next 30 minutes. 8:44 am At polling Unit 001, Ward 6, Bwari, Abuja, the Presiding Officer, a corps member who identified himself as Ameh, apologised for starting late. “Election is supposed to start by 8 and end by 2” he said. Voting yet to start as at 8:53 am. 8.56 am: At P.U 11, Ward 2, Bida lGA Niger South Senatorial District, there are cared reader problems. Voting is ongoing, however. 08:30 am: There is a problem at the INEC office in Bonny LGA with materials not moved to polling units. 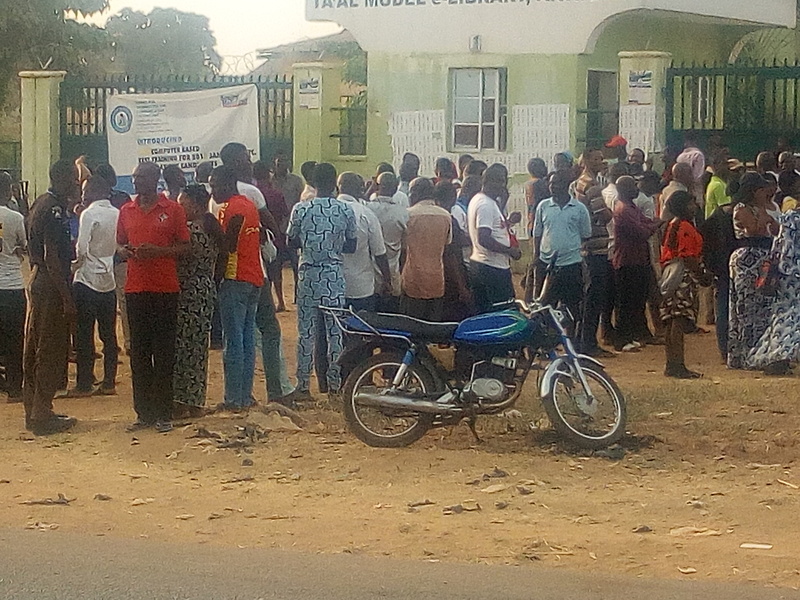 One person says some politician led thugs to the office to prevent voting in the LGA. 8:43am, Ward 02 PU 012, Shomolu Lga Lagos East. PO addressing Voters on the election procedures as voting is yet to commence. 8:41am. Ward 08, PU023 VP A and B Oyadiran estate/Abule Oja Lagos Mainland LGA, Lagos Central Senatorial District, Lagos state. Election materials INEc official and voters are on ground. The officials are still setting up. The delay was due to the unavailability of chairs and tables. No canopy provision made. As at 8:48am PU 009 More ward 1 Ife Central local government Osun East senatorial districts. Accreditation and voting exercise is in progress. All voters are on queue. The citizens are already voting here, all the officials, party agents and security personnels are around. There was a small argument because preference was given to the elderly people. 8.42am Demonstration PRI SCH Awka south, Anambra Central PU1VP1: accreditation of voters have commenced. At Wuse Zone 2 poling unit, there are complains of the ballot papers being too long. After voting, the ballot paper cannot be folded in because it smears another party, thus voting the vote. And when folded out, party agents can easily see the party voted for. A controversy arises as an APC party agent insists on assisting the elderly people to vote. He is eventually allowed by the police officers present. Other party agents shout and oppose the action. Info: The PO was seen addressing the awaiting voters about the guidelines of the election. The election is yet to start as the APO 1 complained of delayed transportation to the unit and late arrival of security agents. However, he promised the election will kick off anytime from now. It was gathered that Iyiola Omisore hasn’t come to vote in his poling. Moore ward 1Pu 003 Ife central, Osun East senatorial district. 09:09: At Ward 15 (Bua Yhege) Gokana LGA of Rivers State, there’s ongoing trouble between PDP and APC supporters. PDP want the materials to be moved to each of the villages, that’s the PUs that constitute the ward for separate conduct of elections. APC agents disagree insisting there is no security in the villages and taking materials there for voting would allow rigging. The election is not taking place and security operatives are helpless. 09:10 Fight starts between the APC and PDP supporters. No voting as of now and security operatives are not able to restore calm. 9:12am: OYO NORTH: Iseyin LG, PU 008, Arowojede II, WARD 8, Isalu II. Accreditation and voting have begun. Party agents are close to the ballot boxes. At Nteje Oyi Local Government Anambra North Senatorial district PU 002 ward 4 , one PU and one VP. One Police officer are seen. People have lined up to begin voting. Senatorial District……. Kank Central LGA…… Madobi. Ward…. Kwankwaso Polling Unit…….. Tudu (005) Time: 9:23 Am Situation Report………. Party agent are been accredited at exactly kwankwaso polling unit. But the card readers are really given them challenge as its not capturing their information. 9:10 am: At Ughiogwa Ward 1, Polling Unit 3, Etsako Central, Edo North, the security officer just called the designated PREMIUM TIMES reporter aside to tell her that the card reader has not worked from the onset and they have been voting manually. The three card readers failed and the P.O said they should check their name on the list and vote manually, hence the party agents (APC) and (PDP) are using the opportunity to influence the elderly. At Sun City PU 0013A, Kabusa, officials and materials arrived 8:37 a.m. Names of voters present have been taken and things are proceeding peacefully. 9:24am Ward 09 VP 1-3, PU002, State gramme school, Eric Moore Surulere LGA, Lagos Central Senatorial District, Lagos state. Election materials INEc official and voters are on ground. The election has started in full-scale cubicles are well secure. Sentorial District, Kano Central, LGA – Madobi. Situation Report……….Soldiers standing directly close to the Ballot box. This is one of the polling unit in Kwankwaso polling center. 9.22 am At Umuora Square PU 6 Awka North, Anambra Central: voters are on queue as they await authentication of their PVCs. The presiding Officer said the SCR read the cards but fail to authenticate them. He has called the technical support and they are on their way. 9:28am PU 03 Ward 8, Atiba Isale Oyo, Oyo state. The polling unit is very rowdy, the ballot box is seen beside the queue. A police man and woman are seen and they have not been able to maintain any orderliness so far. party agents a very close to the voting point and can be seen conversing with voters. I noticed one instructing them on which finger to use. 9:22 am. At Akho Pry Schl PU 001, Irrua, Esan Central LGA, Edo Central Senatorial District, there are two voting points.There are complaints that the ballot papers are not complete. The voting is yet to start and there is contemplation on the next step to take. The voters are growing impatient while party agents are arguing with the ad-hoc staff because the card reader is showing invalid date in one of the VPs. 9:18 am: EDO NORTH, ETSAKO CENTRAL. At St. John primary school, Ward 1, PU1, voting and accreditation has commenced. The total registered number of voters is 647 but they were given 600 ballot papers because they are sure they won’t use all. 9:22 am: EDO NORTH, ETSAKO CENTRAL. St. John primary school, Ward 1, PU2, total registered number of voters is 521. Voting and accreditation has commenced but the PDP agent is arguing with the police officer that he wants to assist the elderly to vote. 9:49am, Edo State – Voting is also yet to begin at RA 03, Ogida/USE, PU 004, Ogida Motor park, Ogida IV, the electoral officers came late to the polling unit, there’s a sort of little rancor as voters have created a queue in readiness to cast their votes but the electoral officers are still setting up. 09:40am Ward: Ijebu 2 ward 005 Polling unit : 006A LGA: OWO Senatorial district : Ondo North Info: The governor of Ondo state Rotimi Akeredolu Aketi is here currently exercising his right to vote at owo. He came in with a convoy of 4hilux,2 jeeps and his personal car. He actually jumped the queue with his wife. The card reader read their card and scanned the thumbprint successfully. He talked about the readiness of the inec officials and the prompt delivery of materials at his polling unit. He came into the polling booth peaceful without a security by his side. Atiku, Titi arrive polling unit in Yola. it has been confirmed that one of the card readers is Nt working. 9:52 at PU 007, New London , Bagama A ward, Suleja, Niger East. 9:53 PU 012 Zauda Village 1 Emirs palace Ward 12 AMAC Municipal FCT Abuja Num of REG voters 2056. INEC staffs and security personnel just arrived. 9:50am Ward 01 PU 011 Shomolu Local Government Lagos East Senatorial District. Voting has not commenced as PO Still addressing Party Agents. At 9:54am, Ward D, PU 021, Alimosho Local Government, Lagos West Senatorial district, Lagos State. APC senatorial candidate, Sen. Solomon Olamilekan Yayi, just arrived his polling unit. Presiding officer complains of the failure of the card reader to authenticate PVC, incomplete voters register and absence of SPO to help come and proffer solutions. 9:21 Confusion at Ahmadiya pry. sch. Olushi ii (PU: 24/14/11/005, Lagos Island, Lagos central senatorial district over party agent form. According to a voter, the PO has refused to commence voting till the arrival of the form, voters are angry and demanding that the voting process should start anyway. Contrary to the stipulated rules of the electoral processes that there should be no campaign posters that could woo voters at the polling units, a couple of campaign posters have been spotted at Hakimi Polling Unit 006 in Wammako Local government, Sokoto. Posters of a senator, Aliyu Wammakko, a member of the Senate representing Sokoto North is sighted pasted around the polling units. At first, the posters were shielded by some hoodloms who stood there with hard faces. Meawhile the reporter found his ways and took the pictures. It is understood that the area is APC dominated. On the roof of a building adjacent to the Polling unit, “All Ya Gode” is boldly written. 9:43am: An intended voter at PU 001, Ushafa Ward, Bwari,Igboyi Abuja, Rosemary, complained that she has been disenfranchised because INEC officials kept telling her her PVC was not ready but her name now appears in the polling unit register. Meanwhile, voting is going on peacefully at the unit. The police here cannot control the party agent of the APC as the elderly voters are requesting him to help them vote. But the youth among the voters are angry about the situation. Voting, originally scheduled to open 8 am across the country, has not started as of 09:43 am anywhere in Khana LGA of Rivers State. It was just 09:21 am that materials started leaving the LGA office for polling units and as of now several buses are still on queue awaiting deployment. The EO for the LGA, who is apparently, overwhelmed, declined comment. But we are able to confirm disagreement and mutual suspicion between APC and PDP is causing the delay. Senatorial District Kano North,LGA Rimi Gado, Ward Ugunwar Ganji Open space. Polling Unit 011, Time of Visit 10:00am, Situation Report Card reader failing to accept some voters as the adhoc staff said thats what they have been experiencing since they commence voting by 8:50am . 10:05am Ward 09 VP 1-3, PU002, State grammer school, Eric Moore Surulere LGA, Lagos Central Senatorial District, Lagos state. 9:56am: PU 03. Elepa, Voting is in progress. PO, however says the unit is having the issue of card reader authentication issues. But according to him, he’d call the SPO who is said to be on the way to the unit. There’s additional VP to the unit. At 9:59 am, PU 021, Ward D, Alimosho Local Government, Lagos West senatorial district. Senatorial candidate for Lagos West Senatorial district under the party of APC joins the queue. Voters are agitated over the delay caused by the malfunctioning of the card reader. They would not allow photographs taken even though the security personnel and ad-hoc staff disagreed with them. The voter vowed to smash the reporter’s phone if he took it into the compound. 9:56 am: At PU 03. Elepa, Offa LG report, Kwara South, voting is in progress. PO, however says the unit is having the issue of card reader authentication issues. But according to him, he would call the SPO who is said to be on the way to the unit. There is additional VP to the unit. 9:21 am: Edo State, Egor Local Government, RA 04, Egor, PU 007, Tipper Garage/Market Square, Egor 1 – voting is yet to commence and there are 3 voting points, However the voters list has been pasted on the wall and people have formed a long queue but the election officials are yet to set up the materials due to their later arrival and the overwhelming crowd. 9:30 am: Enugu state, AWGU LGA. Community School, Ezioha. Ward 2 and 3. This PU has two PU. Distribution of materials to various wards currently ongoing here as staff jostle to collect materials and report to their areas. 9:37 am: Ezema Ward, 002, IGBO EZE South LG, Enugu North, Name checks have commenced, and the environment is normal. The election process just started here. Voters at the polling unit of Nigeria’s Senate President, Bukola Saraki, decried the delay in the arrival of INEC officials and voting materials Saturday. According to the electoral commission’s guidelines, the poll for the presidential/senatorial polls of Saturday opens by 8:00 a.m. and closes by 2 p.m. But this newspaper observed that as at 8:25 a.m, INEC officials and materials are not at sight with the electorate lingering around in their numbers. Some of the voters who spoke with PREMIUM TIMES at PU 003 Agbaji ward of Ilorin West Local Government Area, condemned the delay caused by the Independent National Electoral Commission (INEC). “I’ve been here since 6:00 a.m. because I stay far away from here. I came early to meet up with the scheduled time. It’s unfortunate that INEC is the one delaying,” she told this paper. Similarly, at a polling unit in Agbo-oba area of Ilorin, a logistics concern is expected to cause a delay as voting materials meant for another unit in Adewole was supplied to the Agbo-oba unit. “Our materials in Agbo-oba aren’t the ones we have here. Some are for Adewole 007. We hope this would not create confusion,” Bayo, a voter, said. Meanwhile, at Isale Aluko area, voters have out in their numbers to exercise their rights. Our correspondent observed that security situation in the area had been beefed up to address breakdown of law and order. About 8:30amWard:12,PU:007, Sagamu L/G .Ogun east senatorial district. Ogun state.Otunba Gbenga Daniel arrived at the polling unit,he was given preference inorder to cast his vote, unfortunately,the card reader stopped working.but it later worked. He preached free and fair election to the people of ogun state. Christ Church cath. sch. broad st. odunlami lane iii (PU: 24/14/11/008. Lagos island, Lagos central. 10:09am BABATUNDE Raji Fashola, is interacting with one of the children at the PU. 10:04 a.m: PU 021, Ward D, Alimosho Local Government, Lagos West Senatorial District, Lagos State. The election process is yet to start. The senatorial candidate of the APC, Solomon Olamilekan, is on the queue. 10:08 a.m: PU 10 and 14, Gerald, Ikoyi, Eti-Osa Local Government, Lagos State. INEC officials not yet around. Voters waiting. 10:11am Roadside, near Continuing Education Okengwe 2. Abugu, Ozuja, Okene. Elections have commenced but the PO said they were not provided with security and party agents are not abiding by the rules. He said they slept at the primary school up till the morning and so far no allowance has been paid. He also said corp members who complained were threatened that they would be replaced before election day. No claims of replacement so far and it has been peaceful. At Polling Unit code:001, Dass LGA, Bauchi South Senatorial District, voting commence an hour ago as Preceding Officer confirm to me, it going smoothly and in peace. Hon. Maryam Garba Bagel representative of Dass LGA in Bauchi said the process is fair enough and they (APC) are winning already. Senator Shehu Sani being accredited by the INEC ad-hoc staff. 10:11 a.m: Okengwe Ward 2, Abugu, Ozuja, OKENE. Elections have commenced but the PO said they were not provided with security and party agents are not abiding by the rules. At 10:15 am, Ward 004, Tudun Adabu obi local govt of Nasarawa State. The card reader just started working and voters argue as to who came first and who should vote first. 9. 53 am: The PU 008, Gololo, Gamawa, Bauchi North, is unorganised. Party agents were getting too close to the voting cubicle. Reporter: What will you say about the conduct of the election so far? Reporters: If you lose this election, will you accept defeat and congratulate the winner and handover power eventually? Buhari: I will congratulate myself, I am going to be the winner. Thank you very much. 10:14 am, Edo State, Oredo Local Government Area, RA 01, Ogbe, PU 002, Ogbe 1, Urhokpota Hall II, Voting and accreditation is currently in progress. Preference is also is given to the aged ones on the queue. The card reader just started working and there are pushing and shoving among voters over who came first and who to vote first. Card reader not working in Unit 013, Ward 4, Ibiono Ibom Western ward, Akwa Ibom State. Voters are expressing frustration and angst against the electoral system. 10:25 a.m: Senator Philip Aduda just voting. Time: 10: 33am: Polling Unit: 007, Ward: 01 Ado ‘A’ Idofin, Local Govt: Ado Ekiti local government, Ekiti Central Senatorial District, Ekiti State. Voting exercise going on peacefully. 10:04am PU 09 Amesi Aguata LGA of Anambra State. Some women lined up to collect money from party agents at the back of a building after voting. N2,000 per head. It is, however, not clear if and how the agent giving the money confirmed who the women voted for. At: 10:02am PU 003, Rac 05 Ajaganbe, Epe local government. Lagos state Governor Akinwunmi Ambode cast his vote, speaking with the media he said ” I can observe the election is going on peacefully across the state I am delighted that Lagosians have been very cooperative that we have a peaceful night and ever since morning everywhere has been peaceful. He appraised INEC ” I commend INEC they have been up to the task and almost all election materials are in place and places where materials have not gotten to obviously they are up to the task and those things are already been done. This election will be peaceful. I pray it will be very successful” he said. The INEC officials and electorate at Tshohowar,Magina, Shiyar , Galadima, Ilella 3, Sokoto East, have lamented the shoddiness of election card readers. The presiding officer explained that the card reader was identifying the details of the electorates but it failed to recognise the finger print of the electorates. Onr of the voters, Magori Laru Yusuf, said he had tried about 10 times with ten fingers and the card reader is not recognizing his finger prints. The card reader has rejected the finger print of over 20 voters and up till now effort by the officials to solve the problem proved abortive. The Assistant Presiding Officer, mukhtar Musa told this reporter that they have been calling the emergency room since morning but they didn’t attend to them. The INEC officials have therefore resorted to manual voting so as to allow the voters to vote. However, the presiding officer, who simply identified herself as Dorcas said he has contacted the headquarter and they have told them to resort to manual verification if the card reader does not identify the finger print of the voters. One of the Technical Support, Staffs finally, Samson Iyiola clarified that the card reader reads the information of the electorate only that it fails to authenticate their finger print. 10.33 am: PU 13 AGUOKA, BAKASSI CAMPUS AWKA SOUTH LGA, ANAMBRA CENTRAL: voting on going, SCR authenticating some PVCs, while those who were not authenticated are thumb printing manually. 10:40 am:.At Ward 1, PU 006, Awgu LGA, Enugu State, voting stopped at Community School Ululor Ohaja which has two PU due to SCR failure. The PO ordered this halted until it is rectified. The vice presidential candidate of the All Progressive Congress APC, Yemi Osibajo, arrives polling unit with wife to cast his vote. @YeleSowore, the presidential candidate of the @aacparty has cast his vote in what he described as “a little bit cumbersome and frustrating” electoral process. 10:34 a.m: PU 001 Isapa, Ekiti LGA, Kwara State. The APO II told observers they are not allowed at the polling unit in Kwara South Senatorial District. 10:40 a.m: PU 003 Agbaji Ward, Ilorin West Local Government, Kwara Central Senatorial District. The Senate President, Bukola Saraki, was delayed from leaving his polling unit after he voted by his supporters demanding money from him. 10:28 am: At PU 06 Ward 04 in Pategi Kwara State, voting is going on smoothly. An official (Sheriffdeen) says the voters are illiterates and do not know how to cast their votes. So he told them to pick people to guide them on how to vote and also the parties to vote for. 10:50 am, PU 001, Ward 01, UMCA LGEA school, Jebba, Moro LG, Kwara North. The election has started. Everything is going smoothly, the queue is orderly, just one voting point. Security officials are around too. Election yet to commence in the area due to card reader failure. The PO said one of the APOs has taken the card reader back to the RA for replacement. They were still waiting for him to return. Voting in progress. SGF Boss Mustapha cast his vote at about 9:30 a.m.
11:05am, PU 34, 1004 estate, eti-osa local government, card reader not working, PO said he called SPO and he is yet to get there over 4hrs. Voters are complaining and angry. 10.53am PU14VP1 RUFAI GARUBA SQUARE1 AWKA SOUTH LGA ANAMBRA CENTRAL: student party agents seen lobbying fellow students to vote for their candidates. The presiding officer said the exercise started at 9 am, an hour behind schedule. Besides the low turnout, the PO said the process had been peaceful and free of hitches. 10:50a.m: After he voted at about 10:35 a.m., Senate President Bukola Saraki was barred by supporters from leaving his polling unit They demanded money from him. Mr Saraki voted at his PU 003 Agbaji ward of Ilorin West Local Government Area. He was later allowed to exit the polling unit. Supporters who demanded money from him were asked to follow the convoy as it is an offence to distribute money at the polling centres. 10:45 am. At Idinegbo Primary School, PU 005, Irrua, Esan Central LGA, Edo Central Senatorial District, the PU is in disarray. Party agents, voters and Ad-hoc staff members are not cooperating. 10:57 a.m: Officials just setting up voting point 07, polling Unit 003 at Dutse LEA primary school, Bwari Area Council of Abuja. Voters who have stayed in the queue all morning are grumbling. The Commissioner of Police in Oyo State, Abiodun Odude, on Saturday visited the polling unit of governor Abiola Ajimobi. The commissioner arrived Ward 011, PU 021 of Ibadan Southwest LGA situated in Oluyole Community Grammar School, Ring Road, Ibadan at 10:05 a.m.
Mr Odude commended the turnout of voters for the election saying this is as a result of the security in the state. He, therefore, assured voters in the state of adequate security throughout the electioneering process. “We have come to find out from the officials who are on ground whether there are issues they would want us to rectify or whatever…whether they have concerns,” he said of the purpose of his visit. Voting did not start until 9:30 a.m. in all the PU’s in the school. “We want to assure them that adequate security is in place. Some of the patrolmen I promised are there on the road; we saw them. The governor of the state, vying for a seat in Oyo south senatorial district, was yet to arrive at the PU to cast his vote. The presidential candidate of the Peoples Democratic Party (PDP), Atiku Abubakar, says he is looking forward to a successful transition after the presidential election. Mr Abubakar said this minutes after casting his vote at his polling unit of Ajiya in Yola North Local Government Area of Adamawa State. Mr Abubakar was reacting to questions from journalists on his assessment of the elections. Mr Abubakar was apparently reacting to President Muhammadu Buhari’s response when asked the same question earlier. Mr Abubakar cast his vote almost two hours after the commencement of the presidential and National Assembly elections nationwide. Mr Buhari, the APC candidate, voted four minutes after the commencement of polling in Daura, Katsina State. A total of 73 presidential candidates are participating in today’s election. However, the contest is expected to be between incumbent Messrs Buhari and Abubakar. At 10:49 am PU 22, Ward 3, Alimosho Local Government, Lagos West senatorial district, Lagos State. The APO 2 shouted that voting should not start yet as the materials for the election have not been checked. She said the ballot papers and card readers have to be checked before voting can commence. At 10:56 am, PU 023A, ward 3, Alimosho Local Government, Lagos West senatorial district, Lagos State. There is unease between the INEC officials and voters as the voters lament the slow pace of the process. The senator representing Abuja, Philip Aduda, has commended the Independent National Electoral Commission (INEC) for smooth conduct of the elections. The lawmaker who arrived his polling unit 004 in Karu, at about 10:00 a.m. addressed journalists after casting his vote. Although he expressed disappointment at the postponement of the earlier scheduled elections, he, however, asked Nigerians not to give up and stay true to themselves. “So far so good, we are waiting, we are watching, INEC has put in place infrastructure – I have voted and it was quite easy and smooth. I wouldn’t say the postponement was justified, if we had done this last week we would have concluded by now. The PDP senator asked Nigerians to believe in themselves and “trust themselves”. “We are working to get Nigeria working again,” he said. A former Sokoto State Governor, Aliyu Wamakko, arrived at the polling unit to cheers by some voters. However, he broke protocol by jumping the queue, ignoring voters who had been waiting for hours under the sun. He was allowed to proceed to the polling booth. 11:40 a.m: Sarkin Ada, Sokoto North, Polling Unit 010. A clash as angry voters protested that party agents were influencing illiterare voters. Civil defence officers tried to restore calm. Party agents previously stood too close to the cubicle and told voters, especially elderly ones, who to vote. Angry voters walked to the cubicle and demanded that the agents leave. 11:00 a.m: PU 014, Nyanya (Under bridge), Abuja. Voting process peaceful. Voters say the officials arrived on time and commenced accreditation almost immediately. 11.35am: Soldiers curtailed a violent fight between drunks, nabbed two at Muslim bus-stop, Lagos-Ibadan Express road, Oluyole LGA, Oyo Central Senatorial District. The following polling units are yet to begin Voting. 010,011,012. The POs said he has called the EO several times but he keeps telling them to exercise Patience. The EO also said any manual voting will be cancelled in the polling units. People are waiting. Meanwhile Party agents are taking people to the classrooms after they have finished voting. Party agents were seen following voters to the cubicle to help them make their choice. 11:26 Unit 14, Ward 10, Sagbama LGA of Bayelsa State. Card reader now working and voting has commenced. 11: 25 am – There is a massive turnout of voters at the Junior secondary school, Wuse Zone II. The school has three polling units: 004,005,006. Voting is ongoing at poling units 005 and 006. At polling unit 004, voting was yet to start. This is because the card reader was not working. The presiding officer at the unit said the card reader could not read the cards of the voters. At the polling unit, the voters became angry and agitated. She told a reporter that she is the incharge of card reader technicalities and that she has over 30 polling units under her. At the time a call was placed to her by a corps member in polling unit 004, she said she was at Maitama. She advised the corps member, who is an INEC ad-hoc staff, to share a card reader with the other polling unit in the school. 11:51 am Ward 07, Unit 009, Ibadan South West, Oyo South Senatorial District. Vote ongoing peacefully, the security personnel are on duty. Due to the postponement of the 2019 general election, the Independent National Electoral Commission (INEC) is experiencing shortage of ad-hoc staff in some polling units in Kosofe and Shomolu Local Government Areas of Lagos State. Instead of the four ad-hoc staff that were meant to work at every polling unit, only three are present in most polling units in the areas. At Ward 3, PU 2, Mende-Maryland in Kosofe Council, which has two voting points, only five ad-hoc staff were present instead of nine expected at the points. “Many ad-hoc staff opted out due to the postponement of election, so they had to use the available people. In fact, SPOs were still looking for replacement of absent workers as at yesterday but this did not come forth,” one of the ad-hoc staff explained. Furthermore, in Ward 5, PU 121, Mile 12, Kosofe, voters are voting in fear while the adhoc staff are experiencing a high level of insecurity due to the absence of security officers. According to the Presiding officer, transportation and security were not provided for them, which caused their lateness to the polling unit. Speaker, House of Representatives, Rt. Hon. Yakubu Dogara casting his vote in the Presidential & National Assembly elections in his home town of Gwarangah, Bogoro LGA, Bauchi State on 23rd Feb.2019. Photo : Speaker’s Media Office. 12:02 pm: At PU 007 /001/12/24 in Ikorodu LGA Lagos East Senatorial District, Lagos state, there is nobody on the queue again. INEC officials are now waiting for voters before end of election. 11:55 a.m., at Igbariam primary school I, Achara layout west, Enugu South LGA, Enugu East Senatorial District. Voting is ongoing, but they are having issues with the card reader. Voters are complaining that the officers are slow. Aside from that, the election is going smoothly. 11:33 am, Voting is ongoing at PU10 Ward 4 (Onne) in Eleme LGA of Rivers State in a disorderly manner with the officials struggling to ensure calm. Voting started at 10 am, two hours behind schedule causing disorderliness as voters want to ensure they vote before the exercise closes. More so, the presiding officer, a woman corps member, said the card reader was not functioning well. “This thing (card reader) is not working well,” said the PO. “It has only worked one time of 10. She said the INEC at the PU is verifying details of voters not accredited electronically using the voters’ register. But the turnout here is impressive compared to what was observed in Ohio/Bolo LGA. 11:53 According to local radio reports, election materials have been seized at Wards 4 and 12 of Ikwerre LGA of Rivers State amid heavy shooting. Transport minister Rotimi Amaechi’s Ubima Community is in Ward 4. The trouble reportedly started just after Mr Amaechi left the PU8 where he voted. An aide to the minister said: “I just got that” when asked to confirm the incident. Apart from Mr Amaechi, a former governor and PDP leader, Celestine Omehia, is also from the area. 12:06 pm Polling units across Ward 5 (Township) Port Harcourt City LGA of Rivers State have low voter turnout. As of now, at PU43, PU44 and PU45 all on Moscow Road, there is no single voter before officials for accreditation to vote. The conduct here is however peaceful. Minister of Information and Culture, Lai Muhammed, just left the queue and was driven off after receiving a call. L.G.E.A SCHOOL OGAMINANA 1, ADAVI LGA. Voters complain that party agents are influencing voting. The ballot box and cubicle have been moved close to the officials where they are believed to be more secure and hidden. Voting is fast. But some people’s card were not recognised by the card reader. PDP senatorial candidate, Smart Adeyemi, has been on ground since morning but has not voted. He refused to speak to the media as he left the polling unit. As at 12:10 p.m., voting in eight polling units visited in Suleja, Niger State is going on freely without hitches. But of all the polling units visited, just one election observer was seen. Asides minor scuffles by voters that queued in long lines, the process has been hitch-free so far. The cubicles were placed sideways to ensure voter secrecy as INEC promised. Ward 1, Unit 1, Central Primary School, Upenekang, Ibeno LGA of Akwa Ibom. Two police officers, Two NSCDC officers and one road safety officer were present. None was armed. Many of the voters have voted but are still waiting around. 12:28 p.m., Ward 7, Community Sec. School. Itu LGA, Akwa Ibom. Ballot boxes have been snatched by thugs accused to be sponsored by a political party. Lagos State Governor, Mr. Akinwunmi Ambode, being accredited during the Presidential and NASS Elections at Ward A5 Polling Unit 033, Ogunmodede College, Papa, Epe, on Saturday, February 23, 2019. Lagos State Governor, Mr. Akinwunmi Ambode (middle) and his wife Bolanle (right) waiting on the queue for accreditation during Presidential and NASS Elections at Ward A5 Polling Unit 033, Ogunmodede College, Papa, Epe, on Saturday, February 23, 2019. PO said voting commenced at 11:45 am because of network issues with the card readers. Shortly after that, she stopped the voting process because party agents were causing rancour and there was no security official present to put the place in order. Voters waiting to collect money from APC agent in an apartment. Sources said the voters were promised N3000 each. 12:10 am. Enugu State, Aninri LGA, Ward 10 PU 001. Party agents telling voters where to vote. One agent is in a serious altercation with a policewoman when he was cautioned. 12:44 pm: Enugu state, Aninri LGA. Ward 8. PU 007.Community School Ezza Umuoma, Aninri, Enugu State, the PO says they lack materials especially ink. They were not given ink. Also, because the boxes had separate stickers on them( e.g the box for house of Rep. had governorship sticker and that of senate had State Assembly), the APO had to be helping voters place their ballot papers accordingly. At 12:56 Oyo North, Ogbomosho North LGA, Ward 5,PU 006,- no voting at the moment, officials are waiting for 2pm to to close voting for the day. 12:57pm: Ward 10, Unit 5, Abeokuta South LG, Ogun Central Senatorial District, Ogun State. Campaign banner of PDP, showing picture of Atiku and Co is seen at the top of the storey building where voting exercise is taking place. Campaign posters round the building were left alone, which should not be. 1300hrs. Uruan LGA, Akwa Ibom State. Collation Officer says time will be extended for PUs that started late due to delayed deployment of materials and other sundry matters. Voting still going on. Security persons present. No arms. No violence. Party agents telling voters who to vote. One agent is in a serious altercation with a policewoman when he was cautioned. PO said they were not given ink. Also, because the boxes had separate stickers on them (e.g the box for House of Reps had governorship sticker and that of Senate had State Assembly), the APO had to help voters place their ballot papers accordingly. There was a similar situation at Community School, Ezza Umuoma II, WARD 08, PU 14. 1:10pm. Enugu state, Aninri LGA, Ward 08.PU 011. Central school Ndeaboh II. PO ordered that accreditation and voting be stopped due to card failure. Party agents and voters express concern. 1:05 pm, PU 003/002, Ward 5, Ojo Local Government Area, Lagos West senatorial district. Voters are waiting for them to be paid before they vote. One individual called ‘Honourable’ was seen giving some electorates money. He gave N500 to those with ink on their fingers; i.e. those who have voted. At 1:16 pm, PU 002/003, Ward 5, Ojo Local government, Lagos West senatorial district. A senior police officer came in and spoke angrily to the police officers on duty who were sitting idly under the shade far from the voting point while the voting continued. 1:22 pm: Voting has stopped at PU 012, Isale Eko open space at Adeniji Adele/ Iga Idunganran, Lagos Central Senatorial District, Lagos Island. The PO said people have stopped coming out to vote and they are waiting for 2:00 pm so they can start counting. 12:52 pm L.G.E.A CENTRAL 2, OBESSA, OKENE LGA, KOGI STATE. Something fishy is going on. Party officials are helping people to vote. It appears the INEC staff and security agents are all aware. Former Vice President, Namadi Sambo, and his wife, Amina, cast their votes this afternoon at Swimming Pool Road, Police College, Kaduna. After voting, Mr Sambo commended Nigerians for coming out in large number to exercise the civic right peacefully. ‘I am pleased with the turnout of people to vote, and l am also happy with the orderliness of the process. I pray we have peaceful exercise,” Mr Sambo said. Voting is running to an end here. The village head said everything is fine and he believes nothing will go wrong under his watch. 1:25 p.m. Rabiu Kwankwaso votes at his Tundu Polling Unit in Kwankwaso Ward of Madobi LGA of Kano State. Mr Kwankwaso is a former Kano State governor. 1:22 pm Voting buying is going on at L.G.E.A CENTRAL 2, OBESSA, OKENE LGA, KOGI STATE. A vote goes for N1000.00. 1:38pm: Unit 13, Ward 4. Ibiono Ibom LGA of Akwa Ibom. No presence of security agents. Voting is orderly and ongoing. Officials indicated there was no security agent assigned here since the commencement of the process. 1:41 p.m. Many polling units yet to receive election materials or start voting in the local government. Angry youths are protesting. At 2:08 pm, poll officials at PU003 Sarkin Yara ward A, Daura, in Katsina State, declared that voting is over and sorting of ballot papers will begin any moment. PU 12, Ward 5, Saki West LGA, Oyo North Senatorial District, Oyo State. The last voter just finished voting. 1:50 pm: PU: 002, Dwenti, Waduku ward of Lamurde LGA Adamawa South, just concluded their election while.sorting starts by 2 pm. 2:11pm: PU 14, Ward 5, Saki West LGA, Oyo North Senatorial District, Oyo State. Voting has ended. The PO is sorting the results already. 2:00pm. – At unit 007 in Ward 1, Awommama in Orlu LGA, there was a mild skirmish when voters shared money alleged to have been disbursed by the APC. PU 007,Bagama A, Suleja , Niger State. Voting still on and the All Progressive Congress candidate , Abubakar Lado, who is seeking re-election to the house of representative is casting, after the electorate insisted he should go ahead and vote without joining the queue. 1:50pm pu 05 sarkin pandan ward Lafiya,Nasarawa state voting is ongoing but a party agent from apc is getting himself involve with voters as he tries to persuade them to vote for his party. Also people are helping other people to cast their vote. In many areas of Lagos Island especially places in and around Obalende, CMS, Marina, Bar Beach, Osbourne, Falomo, Awolowo road, Bourdillon, Idumota, and Apongbon areas in Lagos, voting exercises are gradually coming to a close by 2pm. In most polling units around these areas, voters are no longer on queue and ad-hoc staffs are waiting to commence counting of votes by 2pm. According to an ad-hoc staff at a polling unit in Apongbon, voters on queue had all been attended to as early as 12:30-1:00pm and they are simply waiting for voting to officially end so as to commence counting of votes. At 2:19 Oyo North, Ogbomosho North LGA, Ward 3 Agebhin, PU 018, voting has ended and party agents are called to verify the number of ballot papers signed out. Many voters are not around to witness the vote counting. 2:28 pm, voting is till onging across polling units in Ward 05, Port Harcourt City LGA of Rivers State. INEC staff said the decision to extend the exercise “for 30 minutes” was reached because voting started late. 02:27pm, Lagos central, Eti-Osa local government, Bonny camp 1, voting has ended, INEC officials are striking out the remaining ballot papers before the commencement of collation. 2:13 Ward 2 | unit 20 | Brass LGA | Bayelsa State. Vote buying pattern unravelled here. Party agents call voters and help them locate their names (they have a copy of the voter register as well as the one pasted on the wall). Once their names are seen, they start talking to them. The voter submits phone number to highest bidder and then proceeds to get accredited to vote. They promise to contact voter later. I’ve heard voters talk about submitting numbers in about three wards so far. Now I understand the entire process. The environment is changing as side talks are seriously going on since. Voting will soon end. Due to card reader malfunction, only about 50 out of the 538 registered voters were able to vote before the challenge. Voters also complained of poor security and logistics. PU 14, Ward 5, Saki West LGA, Oyo North Senatorial District, Oyo state. Voters scared away on sighting military men while the sorting of votes was going on. 2:10 pm. at PU 001 (a & b), Ilofa, Oke Ero LGA, Kwara South, Police officer on duty injured on head . He does not want to talk but people around said he was assaulted by Soldiers. According to eye witnesses, they drove in recklessly and scared people away. The officer tried to intervene by telling them everything was under control. In reaction, a soldier man hit him with stick on his head. Police officer on duty injured on the head. He does not want to talk but people around said he was assaulted by soldiers. According to eyewitnesses, the soldiers drove recklessly into the centre and scared voters away. The officer tried to intervene by telling them everything was under control. In reaction, a soldier reportedly hit him with a stick on the head. Voting has ended at Ward 4. Unit 9. Ibiono Ibom LGA Akwa Ibom State. Voting is Yet to commence at PU 023 Shiyan Namata in Sokoto East LGA as a result of dysfunctional card reader. *Situation Report: The PO in this polling unit complained of faulty card reader. They had to resort to using the manual accreditation. They have 2,500 registered voters in the five voting points. All accredited voters have voted and there is no one on the queue. The PO, however, said they are waiting for more people to come out and vote before the closing of voting. Mr Uba was followed by some army and DSS personnel who immediately asked journalists and observers to go out. They roughly pushed this reporter out after identification and took his jotting note. They said the particular collation centre can only be assessed by them (the military personnel, DSS, INEC Official, and the candidate). 9:21am: INEC Area office Brass LGA, Bayelsa West SD, Bayelsa State. A lot of irregularities with results from ward 6 ranging from mutilation of figures to improper reports where the officials cancelled results. Verification has been placed on hold till the SPO is around. Deputy Governor of Edo State, Phillip Shuaibu, just arrived.